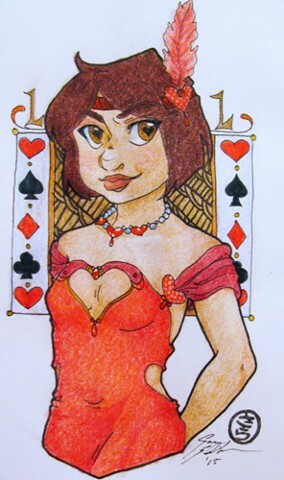 The Goddess Lady Luck from a project called "Card Game." She is one of two remaining active deities and oversees not only games of chance but all manner of luck in the world. Lady Luck has two forms: her true form and her mortal coil. The former reflects the latter and only changes when she takes a new mortal form. The mortal form is always unaware of the power of luck she possesses but can influence others' luck based solely on how she feels about them. Once in a while Lady Luck favors one person in the world and showers them with unusual luck in some form. (a favorite of hers was Frank Sinatra Sr. who was blessed with his voice and career) She's temperamental, sometimes unfaithful, is a terrible flirt, and has a thing for 20s era flapper dresses.